Reading this memoir felt like unraveling a skein of yarn. Stories wound around other stories, threads seemed to wander out in new directions, then with only the thinnest connection the original thread of an account would be picked up. Through the winding and wrapping, Norman wove an interesting pattern of barely hinted insights. First-person. The essay. They suit Howard Norman, whose voice you will become comfortable with in this set of five essays spanning his life from age 15 to present day. Each piece is anchored in place. Each features Norman's associative mind, his attempts to make sense of life's symbiotic relationship with change. The results in some cases are stronger than others.The opener, "Advice of a Fatherly Sort," is a coming-of-age piece set in Grand Rapids, Michigan. Young Howard is shown the ropes by this older brother's girlfriend, Paris Keller. He develops his lifelong interest in birds thanks to his job on the local bookmobile. He tangles verbally with his scofflaw Dad. Not much happens. That said, a lot of successful books offer little in the way of "happens." You have to find the narrator interesting, and Howard is a unique kid. "Grey Geese Descending" and "I Hate to Leave This Beautiful Place" are less compelling, though not without interest. In the first, we are introduced to his ill-fated girlfriend (he's in his 20s now) and his 80-something-year-old friend, Isador, a Holocaust survivor who cannot forgive himself for accepting a bit movie role as a Nazi guard decades ago. He did it for the money. The third piece takes us north into the wilds of Canada where Norman tangles with some some wild shaman-type eccentric. It's hard to develop appreciation for the beautiful surroundings with such an ugly medicine man mugging in front of the camera.For the close, we go to now-married Norman's summer home in Vermont, where he frets over an ill kingfisher and shyster well diggers and his older brother, who wants help in escaping the law. Norman, meanwhile, is bedeviled by a fever that won't go away. Here "place" succeeds in ways it failed in the second and third essay. As for the finale, any tale of a house sitter who murders her 2-year-old son in your house, then offs herself, cannot help but draw you in. Full of philosophy and quiet despair, it's a lovely closing to the set. In particular, Norman seizes on the Frost quote, "The only way out is through" for succor.If you believe essays should stay on topic and be focused like the college models we were taught, you'll find Norman's discursive, wandering style a distraction. At times, though, it's part of the fun. Overall, a pleasant kinship forms. As tour guide, Norman rates high marks. He may talk too much, but he's interesting in his way. Brilliant memoir. Divided in 5 essays in which the writer ruminates on his past experiences. Each vignette reads like a segment of his coming-of-age and the vignettes are in chronological order. The writer is deft at handling issues of loss, death and coming to terms. I was especially intrigued by how birds played a role in the vignettes. My favorite story was Grey Geese Descending that mourns the loss of a relationship. Along the way, Norman drops quotes by other writers such as "the only way out is the way through" (Frost) and others. A quick read but one that has staying power. A series of essays describing important experiences in the author's life. The first is set in Grand Rapids, MI when Norman was a boy. I could identify with much in this essay because we are about the same age. Some of the subsequent essays take place in Canada, including the far north where he lived with the Inuits for a while. He makes just about every character and setting a memorable one with his beautiful writing. I read The Bird Artistseveral years ago and liked it a lot, which is why I decided to read this one. This memoir is the first book I've read by this author but it won't be the last. At first it seemed a pleasant read but I soon came to appreciate his insight and the sheer beauty of some of his phrasing. A mix of everyday life and more dramatic occurances interspersed with philosophical musings and natural history observations it ends with gut-wrenching reactions to a tragedy that occured in his family home, not family-related but it definately affected the family. Yes, that is an extremely long sentence. This is not a difficult book, but a slow, meditative read. And as with so many other books of this type (memoir-essay), I find myself wondering how its construction adds to the whole. How do the somewhat slight-seeming individual chapters slowly build to the powerful, albeit quiet, conclusion? Lovely. Ducks in a RowIn the introduction to his book, Howard Norman quotes twelfth-century Japanese poet Saigyo, who wrote, "A soul that is not confused is not a soul." Norman considers his own soul to be confused, but this book is his attempt to gain some clarity and keep his emothinal balance. Though he is loathe to attribute intrinsic themes to life, there does seem to be some recurring motifs here: Many of the stories are about having to leave places he has grown accustomed to, such as Point Reyes, Vermont, Nova Scotia, Sascatchewan, and the Arctic. Though the place is only mentioned in the introduction, The Villa of the Fallen Persimmons in Kyoto, Japan, where he wrote much of the book, seems like an especially haunting and beautiful place, and one that he would no doubt really hate to leave. Hence the title, I Hate to Leave this Beautiful Place. In one of the five vignettes that make up the book, we learn that a soapstone carver who has turned into a goose, in an old Eskimo legend, begins to lament using those very words, translated from the goose language, when the geese begin to fly South for their winter migration. Which brings us to the other recurring motif: All of the five stories concern a bird or birds--mostly shorebirds. There is a swan, there are Grey Geese Descending, The Maltese Falcon, Laughing Gull, Black-tailed Gannet, whooping cranes, fifty thousand sandhill cranes, peregrine falcons, piping plovers, burrowing owls, ferruginous hawks, loggerhead shrikes, terns, grebes, pelicans, hummingbirds, black-crowned night herons, yellow-headed blackbirds, belted kingfishers, red-necked phalaropes, American avocets, merlins, American kestrels, greater sage-grouses, prairie falcons, golden eagles, chestnut-collared longspurs, great crested flycatchers, ring-necked ducks, willow flycatchers, long-billed curlews, violet-green swallows, Baird's sandpipers, black-necked stilts, barred owls, golden-winged warblers, pile-ated woodpeckers, veeries, Cooper's hawks, migrant thrushes, great horned owls, hairy woodpeckers, gryfalcons, white pelicans, LeConte's sparrows and Say's phoebes, ravens, a kingfisher, an owl named Gertrude, and a western oystercatcher. All five vignettes also share a common protagonist, one assumes it is the author, Howard Norman. He grows a little bit each time, after confronting various "incidents of arresting strangeness." The first story involves some fatherly advice, both from his actual father, and from his boss at his summer job at a library bookmobile. Let's not forget the swan. Next he is involved with an older, more accomplished woman. She wants to elope, but first they must come to an agreement about a painting called Grey Geese Descending. Her name is Mathilde, but little or no waltzing is involved. Next we find our hero on a quest to transcribe Eskimo folktales, but some of the Fear/horizon tales begin to haunt him, and he is also besieged by a local angakok, or shaman, who takes an instant disliking to him. While there tragedy strikes as news of the murder of John Lennon reaches them. This news strikes a local rock band hard as their band specialized in covering Lennon's music. In part IV, called "Kingfisher Days," he is plagued by fever, as he tries to have a well drilled by the local riff raff while fending off calls from his brother who wants to be smuggled into Canada. Finally, in the last incident of arresting strangeness, he lends his home to a poet and her son, and she ends up commiting a murder suicide there. He is thrown into a tailspin confronting the terrible event. Again, the shore birds come to his rescue when he goes to the beach to watch a western oystercatcher and meets a local photographer who is taking pictures of a dolphin carcass. She is married to a Tibetian Buddhist, and they help him see that death is just another part of the cycle of life. At times his life reminds me of that Simon & Garfunkle song, The Dangling Conversation:And you read your Emily Dickinson,And I my Robert Frost,And we note our place with bookmarkersThat measure what we've lost.Indeed, not only is he living in Vermont at one point, which is Frost's country, but he is also studying a Frost poem, "A Servant of Servants," that he hopes will provide some solace for his confused soul. Sometimes, he gleans from this poem, the only way past our troubles is to go through them: I’ve lain awake thinking of you, I’ll warrant,	More than you have yourself, some of these nights. The wonder was the tents weren’t snatched away	From over you as you lay in your beds. I haven’t courage for a risk like that. 170Bless you, of course, you’re keeping me from work,	But the thing of it is, I need to be kept. There’s work enough to do—there’s always that;	But behind’s behind. The worst that you can do	Is set me back a little more behind. 175I sha’n’t catch up in this world, anyway. I’d rather you’d not go unless you must.There are referrences to the poems of Robert Hass, W. S. Merwin, François Villon, Anne Morrow Lindbergh, and also Reetika Vazirani, the troubled poet who commited suicide in his house. At one point, deep in his fever, he falls under the spell of Ken Burns' Civil War documentary, and imagines that a man who bears a striking resemblance to someone in one of the archival photographs is a ghost from that troubled part of American history. Though he spends a lot of time compiling a life list of birds he has seen, you could say that what he is really doing is just trying to get his ducks in a row. A book about seemingly disjointed, but ultimately cohesive instances of meaning in a life. I loved it, but it did take me a very long time to get through it. An interesting read of Howard Norman's life.I have an interest in Inuit tales, and first met Howard Norman as a writer in children's books - "the girl who dreamed only geese: and other tales of the Far North" and "Between heaven and earth: bird tales from around the world".Okay, I have to do it: here's an excerpt from the book (not typical, I admit, but my favorite pages):A poem by Lucille Amorak, an Inuit in her seventies:My aunt held a grudge - she forgot why.My cousin held a grudge - he forgot why.My father held a grudge - he forgot why.Lots of things happened in the village,lots of things.People were born - people died - gullswere everywhere all the time -the beach and the big boulders on the beachstayed put.My cousin lived in another villageand she held a grudge - she forgot why.I held a grudge - it was against a seal - becausethat seal nabbed a fish right off my line!I don't hold that grudge anymorebut at least I remember why I once did.My other uncle held a grudge - he forgot why.My other aunt held a grduge - it was against me.One day I walked over to her house and said,"What's your grudge?" "I forgot," she said. "It was fun holding it," she said, "then it wasn'tany longer. "We sat down for a meal. My aunt was ina pretty good mood - she laughed a lot -I forgot what about. A dreamy memoir, more of a gathering of events that the author has lived through. His dispassionate recollecting made them even more surreal: imagine seeing your father sitting at the diner counter time and again, when your mother has told you that he is no longer living in that town. Or imagine an adult sibling calling you repeatedly (collect) to request that you help him cross the border into Canada to escape the consequences of his white-collar crimes. And I will spare you the last, most disturbing event. Norman writes in a lovely way, but nothing of the book's contents lives up to the striking beauty and power of the title. Howard Norman is an awesome memoir writer. I was totally wrapped up in whatever he was writing about at the time: his mis-adventures as a 15-year-old, observing birds in all their glory, bidding at an auction for an art print when he has no money, sparring with his brother (hooo-yeee: his brother provides more than enough fodder for a separate book! ), interacting with the Inuit people, and coping with catastrophes. The title comes from an Inuit legend of a man who turns into a goose, and his migration song is, "I hate to leave this beautiful place." I felt that way at the end of the book. I had read good things about this book, and thought I'd read it. I really enjoyed about the first 3rd, liked the writing, liked the story. The author tells about his youth, but skips quickly to his 20's. And after reading a bit about his first love, and how he got started writing about birds, it was still interesting. But somewhere along the 20th time he mooned over his lost love, the story kind of changed for me. Great blanks were left between happenings, the writing got a bit dry, I just couldn't keep interested in the book. Got to be an itinerary and not anything to keep my interested. I wish I could give half a star more. I really enjoyed this book, at times, and at other times it felt like it dragged. I don't know if it was me or the subject matter because I don't typically read about these places and things. Yet, the opening stories of loss were so profound, so touching. And, there was much humor. At times, it felt like I was reading a Bill Bryson novel. I can completely relate to the sadness in this man's life as well as the way in which he pulls himself through each episode. I do recommend this book, but come prepared for sadness. "The best way out is always through." 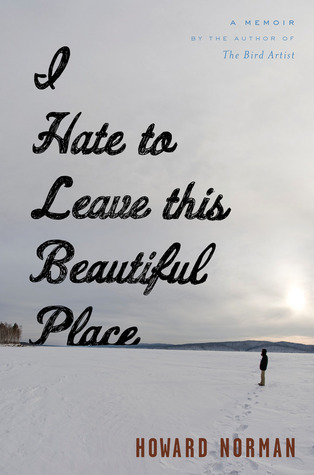 Acclaimed novelist Howard Norman has appropriated this Robert Frost quote as the mantra for I Hate to Leave This Beautiful Place. In this powerful memoir Norma reflects on five pivotal moments in his life beginning with his father's betrayal and ending with the consequences of a random violent act. For those familiar with his novels (The Bird Artist-The Museum Guard - The Haunting), this personal history sheds considerable light on where he gets the inspiration. I've always loved memoirs and this one is especially fine. This memoir, by the author of The Bird Artist, was wonderfully written. It wasn't a memoir in the traditional sense, but more of a handful of essays about moments in the author's life that were significant and somewhat life-changing. It was an easy short read, but still quite powerful, poignant and bittersweet. I have read several of Howard Norman's novels (he is an American who usually places his novels in Canadian settings) but this is a collection of memoir-essays of events that happened to him during his life in five different places. The essays are all somewhat quirky, but also very clearly written. The book is very different from his novels, but still very enjoyable. Terrific memoir full of disturbing and unexpected occurences that throw new light on estrangement, death, grief and redemption. A most unusual life where place and Norman's love of nature figure heavily. As the author states, "There is another world and it is inside this one." I read fiction almost exclusively, so to pick up a memoir takes me a bit out if my element. The writing was immediately accessible and engaging to me, and ultimately I am left with that old adage: why fiction? Life's unreal enough. Dark, poignant, sorrowful, comic. Ah, such is life. A collection of loosely tied remembrances of events both mundane and horrifically tragic in various beautiful locations, including Vermont and the Arctic. The author has a quiet, reflective voice that resonates even after you've closed the book. Quite beautiful and haunting. Howard Norman is an inspiration both for his beautiful writing and for his ability to heal via nature, books, poetry. I felt right there with him through his incredible life narrative. I guess this memoir is not bad per say it just wasn't my cup of tea. An eclectic collection of memories about someone's aimless path in life... without much to it in my opinion. Beautiful haunting memoir built around five chapters in the life of a writer. I pulled this one off of the staff recommendations shelf at the library and I am glad that I did. It was a striking memoir and I thoroughly enjoyed it. I appreciate the way he turns a phrase. I wanted to reach out and hug the young Howard and give him a better young life and then as he grew up I found myself wishing to sit down with this man and have a discussion over tea. Below are the quotes that I loved best (many from others than Norman, he does an impressive job of pulling from other great authors). The last "quote" is actually a poem written by an Inuit woman by the name of Lucille Amorak. I had to have it in a place where I could find it again. "A soul that is not confused is not a soul." -Saigyo"A letter never sent is a kind of purgatory." -Chekhov"What good is intelligence if you cannot discover a useful melancholy?" -Ryunosuke Akutagawa"The Japanese have a saying, 'Rain enters your diary'. It refers to the melancholy that is forever part of your personal history. Later, you find the diary and read it and rediscover how you were experiencing life. The diary remembers for you. ""I heard a rumor once that some people don't have any regrets. Now, what kind of person would that be? Do you want to be friends with someone like that? Would you trust someone like that? ""There is another world but it is in this one." -Paul Eluard"Everything I loved most happened most every day. ""Reserving judgments is a matter of infinite hope." -F. Scott Fitzgerald"If you are walking down the road and you look up ahead and see a house on fire, if you are a good person you don't wish for it to be someone else's house. ""Truly original poetry is the purest air language can breathe." -W.H. Auden"My aunt held a grudge - she forgot why.My cousin held a grudge - he forgot why.My father held a grudge - he forgot why.Lots of things happened in the village, lots of things.People were born - people died - gullswere everywhere all the time - the beach and the big boulders on the beachstayed put.My cousin lived in another villageand she held a grudge - she forgot why.I held a grudge - it was against a seal - becausethat seal nabbed a fish right off my line!I don't hold that grudge anymorebut at least I remember why I once did.My other uncle held a grudge - he forgot why.My other aunt held a grudge - it was against me.One day I walked over to her house and said,'What's your grudge?' 'I forgot,' she said. 'It was fun holding it,' she said, 'then it wasn'tany longer. 'We sat down for a meal. My aunt was in a pretty good mood - she laughed a lot -I forgot what about." In my eyes, Howard Norman never stumbles, but this book-- an autobiographical sketch of episodes and settings in theauthor's life -- was especially gratifying to someone who hasread so much of his work and was able to relate so much fromhis actual history to panoply of fictions he's given us.Even the last segment, a disturbing account of events that took place in Norman's very recent past, emerges in the same timeless, breathtaking incandescence runs through all of his fiction.Particularly if you've read a fair bit of his work, this book is a must. Beautiful prose and unconventional narrative arc within each chapter. A lovely memoir of a writer. I must say I was annoyed by his treatment of the tragic murder-suicide in the last chapter. He acts as though the fact that it happened in his house (although he hardly knew the people who died) makes it his tragedy alone. It is his story, to be sure, but can’t there be room for consideration of others’ experiences and losses within that?